There was a time, not so long ago, when retailing merchandise was fairly simple. If you wanted to sell products on a business-to-consumer (B2C) basis, you would rent or buy a building, stuff it with staff, fix it up with fancy fixtures, produce some products and maybe get a phone book ad. After all that work, you flung open your doors to let the flood of foot traffic in. You didn't concern yourself much with markets in other cities, shipping concerns or customer 'engagement'. The only contact made with the customer was in your store. This model of merchandise marketing had worked for millennia; from the street markets of ancient Marrakesh to today's West Edmonton Mall. Then came the Internet; possibly the greatest marketing tool ever devised. 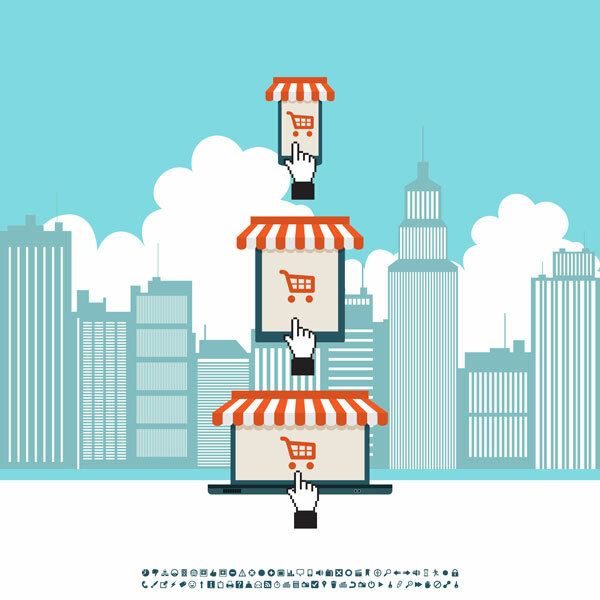 With the advent of E-Commerce and the World Wide Web, the retail landscape has fundamentally changed. The new kid on the block has the pectoral power to significantly erode market share from the old school retailers with their pricey 'bricks and mortar', or BAM, business model. Established companies were forced to either adopt the new revenue stream or accept decreasing ROI; their precious return on investment. Small players, once just mere mosquitoes up against the moose-sized marketers with their glitzy 3D stores, suddenly had the playing field leveled as if by a nuclear device. The large retailers were shocked to find out many shoppers actually preferred this new marketing model of Online Virtual Stores, or OVS, to the sales model that had withstood centuries of success. The fogies in the BAM club soon embraced the ancient adage; if you can't beat them, join them. BAM & OVS - True Love! Although originally leery of this new wave in retail engagement, the big BAM boys discovered that the true road to increasing sales could be achieved by combining the two retail approaches. They discovered that as much as the highly prized 18 to 30 demographic enjoyed online shopping in an OVS, they appreciated the trustworthiness and convenience of having a BAM facet to a business. They didn't have to wait for the post office to deliver their hotly anticipated purchases after weeks of free storage, they could simply opt to pick it up from the store when it was convenient for them. And if there's a problem, there's no shipping costs to return the defective item, either. Consumers could simply take it back to the BAM building they had always relied on to give them face-time service. For merchandising magnates, it was the best of both worlds. Great! Now.... Where to Begin? The vast majority of BAM businesses already have a website. (If you have a BAM store without an online presence, here's why you need one.) Assuming, however, that you do have a website, now you have a choice to make; you can either create a stand-alone site to sell your products or you can add an e-store component to your already existing site. Both have their good and bad points. A separate site can instantly double your Internet presence and provide many cross-linking opportunities to enhance SEO. This also means ongoing SEO resources will have to be expended on both sites independently which will double your optimization and bandwidth costs. A stand alone OVS can feature all your products with glitzy art, multiple images and many fun, interesting features. That sort of content can slow down load time significantly. This generally hurts a branding site more than a sales site as people are more patient when looking for products, as opposed to company information. Getting folks to venture from your website to your sales site may be problematic. What works best for your situation depends on the size of your product line, how much detail you need to display to achieve optimum sales and the familiarity your visitors will have of your offerings before they arrive at your site. Combining old school BAM with an OVS component allows today's savvy shoppers to enjoy the best of both worlds. The online experience allows consumers to become informed about their purchases before they buy, without a salesman in their face trying to close the deal. They can take their time to read reviews, do cost comparisons and even search for coupons. They still get the security of knowing there is a place to go with "real human beings" that can take care of them if the OVS component fails for whatever reason. The likelihood of a BAM operations disappearing overnight like a bitcoin retailer is far less likely. Any way you look at it, E-commerce is now an essential part of most intelligent business models. If you sell products but your website doesn't, you may be missing out on significant profits. Contact your IT people or reputable contract website design company to launch your Earth-bound BAM business into the limitless opportunities of cyberspace.